GREAT FALLS, Montana: A Montana resident believed to be the world's oldest man celebrated his 114th birthday Tuesday at a retirement home in Great Falls. Walter Breuning was born on Sept. 21, 1896, in Melrose, Minnesota, and moved to Montana in 1918, where he worked as a clerk for the Great Northern Railway for 50 years. His wife, Agnes, a railroad telegraph operator from Butte, died in 1957. The couple had no children. Breuning inherited the distinction of being the world's oldest man in July 2009 when Briton Henry Allingham died at age 113. Allingham had joked that the secret to long life was "Cigarettes,whisky and wild, wild women — and a good sense of humor," according to Guinness World Records. The Guinness organization and the Gerontology Research Group each have verified Breuning as the world's oldest man and the fourth-oldest person. Three women were born earlier in the same year as Breuning. Robert Young, senior consultant for gerontology for Guinness World Records, presented Breuning with a copy of the book's 2011 edition that lists him as the record holder. "Walter wasn't in last year's edition," Young joked. "He was too young." The Great Falls Tribune reported that Breuning gave a speech before about 100 people at an invitation-only birthday party at the Rainbow Retirement Community, with a guest list that included Montana Gov. Brian Schweitzer and representatives from Guinness World Records. Breuning was helped up to a lectern from his motorized cart, appearing somewhat frail but speaking with a strong voice. He recalled "the dark ages," when his family moved to South Dakota in 1901 and lived for 11 years without electricity, water or plumbing. "Carry the water in. Heat it on the stove. That's what you took your bath with. Wake up in the dark. Go to bed in the dark. That's not very pleasant," he said. He said men and women may be able to enjoy life, but they can't be content without a belief or faith. His parting message to the crowd was one of tolerance. "With all the hatred in this world, in this good world, let us be kind to one another," Breuning said. Breuning has celebrity status at the retirement home, with visitors waiting in line to see him, Ray Milversted, 92, told the Tribune. Tina Bundtrock, executive director of the Rainbow, said the home has adopted a policy of scheduling visits with Breuning by appointment, so he's not taxed by people dropping in to see him. 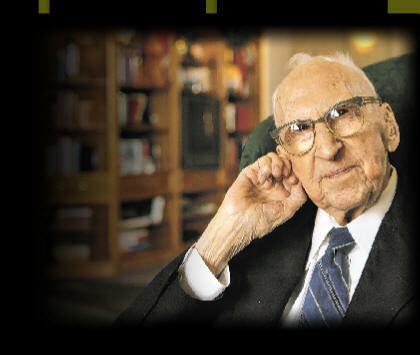 Before his birthday party, Breuning declined to name a favorite among the 114 years he has seen. "Every year is the same," Breuning told the Great Falls newspaper. But he criticized one modern invention — the computer. "When the computer came out, that was one of the worst things," Breuning said. "They laid off all the clerks on the railroad." But, he added, "Every change is good." - AP. My personal view: I like his remark... the secret to long life was "Cigarettes, whisky and wild, wild women — and a good sense of humour." Of the four, i scored two of his good points. I don't smoke and drink but i love beautiful wild wild women and naughty as well. Darn to speak loud with confidence. The good you do, comes back. Comparing & competing can be stressful. Is the customer telling the truth? Can u see he has no money? Old man with young heart. Marry to someone you feel comfortable. How to seek for an ideal man? Tips to make your lady loves you. Hugh Willy is better than money. Two little boys & God. I am a Santa Claus. Do u think the world is fair?